U.S. employers, slow to reward workers with higher pay, have been quicker in recent years to offer signing bonuses, more paid time off and other perks. 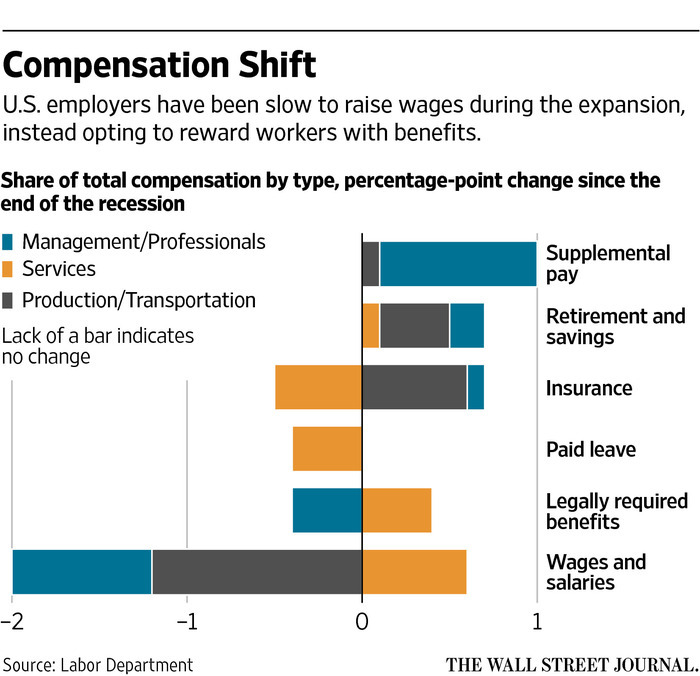 The move toward benefits over pay provides a few clues that help explain a chief mystery of the current expansion: the unusually sluggish growth in wages. Some of the move toward benefits reflects a workforce that puts a high value on flexibility, health insurance, time off and other things besides wages. But the shift also highlights the fragility of an expansion in which employers remain hesitant to commit to higher wages and are turning instead to more revocable perks. That could have broader repercussions if consumers aren’t able to tap bigger paychecks and boost their spending..